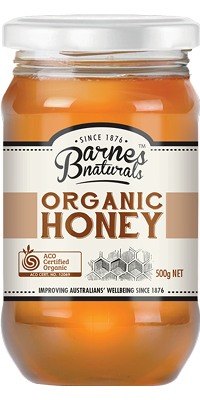 When it comes to quality Australian honey, 'Barnes' is one of the oldest names in the business. That's why we choose Certified Organic honey, produced with care in remote forests that are just as pristine as they were 140 years ago! Each batch of this Certified Organic honey is carefully produced to organic specifications, including the nectar source, foraging area, apiary management and gentle warming for bottling. Our Organic honey is sourced from independently certified organic apiary sites, located in pollution-free National Parks in Northern New South Wales as well as heathland and wild forests in Western Australia. Drizzle on porridge or fresh sourdough toast. 100% Certified Organic Australian Honey.